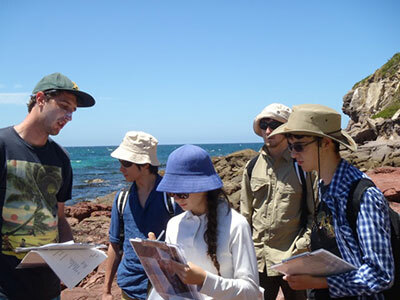 The Atlas of Life in the Coastal Wilderness is running its third BioBlitz in Mimosa Rocks on 7-8 November to explore and record biodiversity in one of the loveliest National Parks on the coast of NSW. Everyone is encouraged to walk with experts and find and record as many species as possible over the two-day event. Mimosa Rocks National Park on the far South Cost of NSW is a jewel of a location for this BioBlitz. The Park stretches along 30km of diverse coastline with rocky coves and headlands, sandy beaches and lagoons all backed by wild bush and forested hills. These great ranges of habitats, and diverse and fascinating coastline give an immense variety of species, both botanic and zoological. Add to this all the expert naturalists and scientists who are leading surveys and activities and this BioBlitz will be a festival of nature that all the family will enjoy. Join expert ecologist Steve Sass from Envirokey to learn about reptiles, amphibians and some of the rarer birds of Mimosa Rocks National Park. Participate in flora surveys of the northern habitats and shell surveys along each of the 14 beaches in the Park. Amy Harris, a Parks Ranger leading a great Shorebird survey, hopes to cover all the beaches and estuary nesting sites of local endangered shorebirds. There will be canoe surveys of the lagoons and dusk and nighttime surveys for possums, frogs and moths. The Mimosa Rocks BioBlitz is a part of the National Parks celebration of the visits of international delegates for the World Parks Congress, this year being held in Sydney. Delegates from Harvard, Senegal and the Netherlands will be welcomed to this corner of paradise. The Atlas of Life was invited by CSIRO to run this BioBlitz and Mimosa Rocks is the ideal location. All our records help to build the national biodiversity database, the Atlas of Living Australia, and this year we are working with a new data capture tool www.inaturalist.org. Ken-ichi, one of the creators of this tool, is coming from California to be with us for our BioBlitz and the World Parks Congress BioBlitz the Sunday following in Sydney Olympic Park. Download the iNaturalist app and register to add your photos and sightings directly from a smartphone or iPad. to the database. Experts will help identify your records. Look for Mimosa Rocks BioBlitz or Sydney BioBlitz under “Projects” so that during the BioBlitz you can add your sightings direct and get help to ID what you have found. All these records will help build our Atlas of Life. All welcome to get involved in this free, fun citizen science initiative. Explore with experts and learn more about this wonderful Parkas you look, learn and record as many species as possible for our Atlas of Life. For details of 40 surveys you can join from dawn to dusk and into the night visit www.alcw.org.au. Libby Hepburn is Convener of the Atlas of Life in the Coastal Wilderness, a long-term project in which members of the community work with scientists to explore, learn and record the natural world.